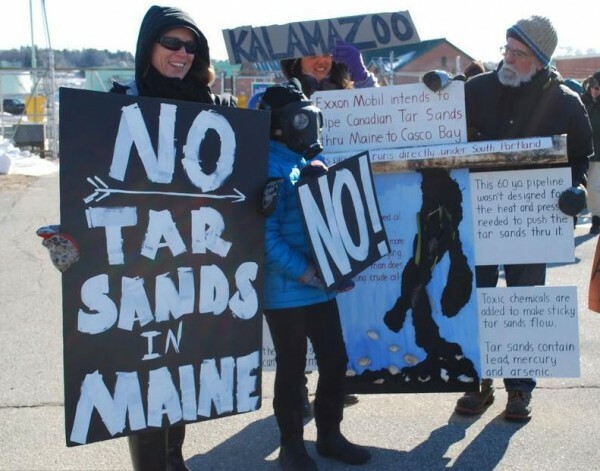 Fryeburg resident Nickie Sekena, her son, Luke Sekena-Flanders, and Porter resident Doug Bowen were among about two dozen people Wednesday protesting the possible flow of Canadian oil extracted from tar sands into South Portland. PORTLAND, Maine — More than two dozen people testified this week on a controversial resolution to ban the city’s use of “tar sands” oil, before the City Council voted unanimously to return the resolution to its Transportation, Sustainability and Energy Committee for further review. Wednesday’s meeting took place three days before what is being promoted as the “biggest anti-tar sands protest in the Northeast” is held Saturday in Portland. As a crowd that filled the balcony of council chambers looked on Wednesday, environmental advocates, business leaders and residents voiced sharply contrasting opinions about the use of tar sands — a viscous mix of oil, sand and clay that is used to produce gasoline and someday might be piped to Portland Harbor for distribution. 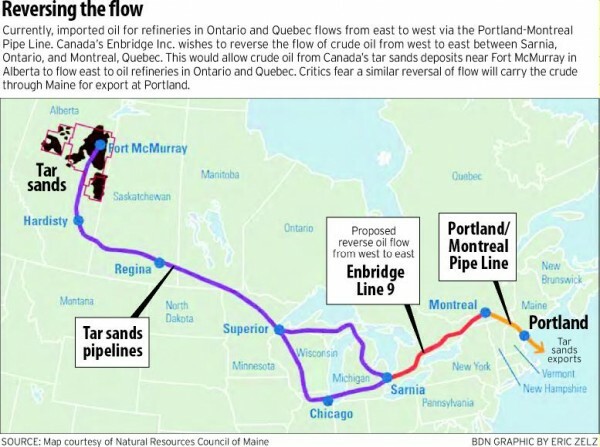 Critics say that because tar sands are heavier and more corrosive than other forms of crude oil, the thick goo can eat its way through pipelines such as the the 72-year-old, 236-mile conduit between Montreal and South Portland. If tar sands are pumped through that pipeline, a leak could endanger the area’s water supply at Sebago Lake and be almost impossible to clean up, because the heavy oil sinks to the bottom of waterways. “Maine and the region have everything to lose and nothing to gain from sending toxic tar sands across our state,” Emmie Theberge of the Natural Resources Council of Maine said. NRCM is one of the groups behind Saturday’s planned protest, which includes a 12:30 p.m. march from Monument Square to the Maine State Pier, where speakers will address the rally. Organizers have said hundreds of people are expected to attend, from every New England state and Canada. Theberge said Wednesday that 2,500 people had signed a petition opposing tar-sands piping in Maine, and she asked those in the audience who had signed it to stand up. Earlier in the day, Mayor Michael Brennan and Councilor David Marshall participated in a press conference on the steps of City Hall to urge adoption of the resolution, which would have “recommended” the city adopt a sweeping environmental performance policy that includes not buying tar-sands oil. “As Maine’s largest city, we have a responsibility to lead and demonstrate to others that by enacting reasonable policies we can make a real difference in the effort to halt climate change and reduce greenhouse emissions,” Brennan said. On Wednesday night, some people opposed the resolution and disputed the environmental claims. “There is not a single scientific, peer-reviewed study out there showing tar sands is any more corrosive than other heavy crude oils that have passed safely through pipelines in this country for decades,” said John Quinn, executive director of the New England Petroleum Council. Jamie Pye, president of the Maine Energy Marketers Association, said enforcing the resolution would be impractical because tar sands are a “fungible product” that can’t be easily identified and separated from other forms of oil. “The city cannot ban what it cannot define,” he told city councilors. Portland Community Chamber lobbyist Chris O’Neil described the resolution as “indefensible, unenforceable and untenable” and said he worried about the potential impact on business. “When the city imposes a mandate like this upon itself, the business community peeks around the corner and asks, ‘Are we next? '” O’Neil said. But all the testimony wasn’t enough to convince the council to pass or reject the resolution. While most councilors seemed supportive of its goals, there were simply too many unanswered questions. “I need more … I want to know how much oil we currently purchase has tar sands in it,” said Councilor Jill Duson, echoing other councilors. Councilor Edward Suslovic questioned City Manager Mark Rees about the impact of the resolution. Suslovic asked Rees how the city would identify heating or fuel oil refined from tar sands, which suppliers could provide oil from other sources, and what its cost might be. But Rees — whose staff is responsible for purchasing, among other administrative functions — said he didn’t know. The problem, Councilor Nicholas Mavodones Jr. said, was that the resolution “commingles issues and administrative regulation,” asking the city to take an environmental stance without knowing its day-to-day implications. Some of the missing answers might have been found in materials and research the TSE Committee compiled in developing the environmental policy. But none of it was available Wednesday night. Marshall, who heads the TSE Committee, said he was “disappointed” that a city staffer wasn’t at the meeting to find the information and address the questions. But he said the committee would take another look at the entire environmental policy and try to come back with a resolution the council could fully support. “I know there are some strong feelings on the issue, but we’ll be able to continue this discussion,” Marshall said.